There are people who have warm, gentle eyes, the kind of eyes that you sense are from a good person. And when you actually get to know that person they’re exactly as their eyes express: down-to-earth, positive, and affable; someone you wouldn’t mind being friends with. 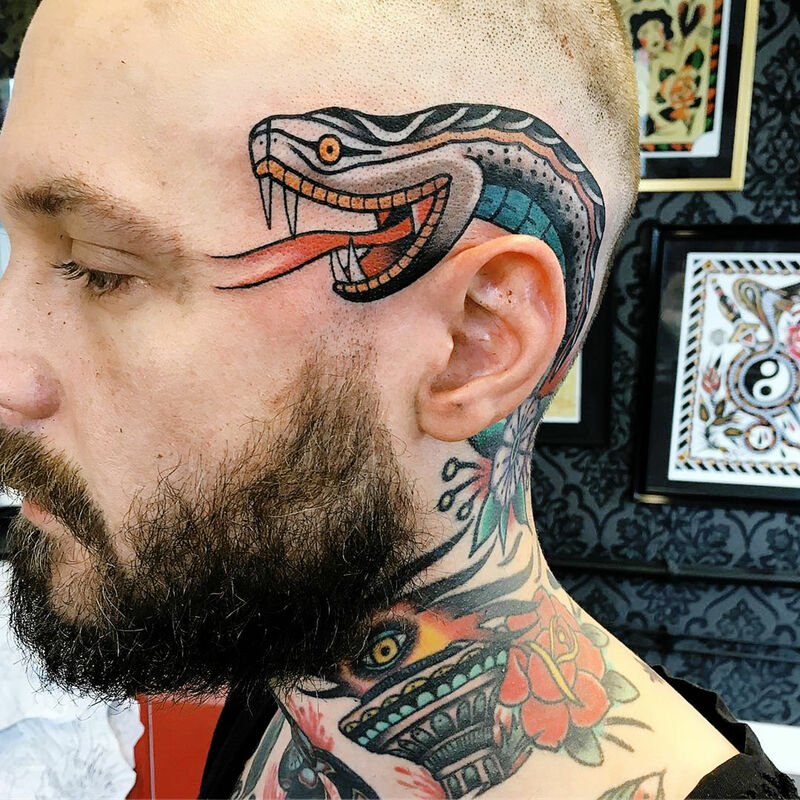 That is Filip Henningsson, a tattooer based in Sweden who has been working for over a decade at the Red Dragon Studio in Umea—a city that is well-known for arts and culture and also a university town. 120,000 people live there and 40,000 are students, many of which are Henningsson’s clients. 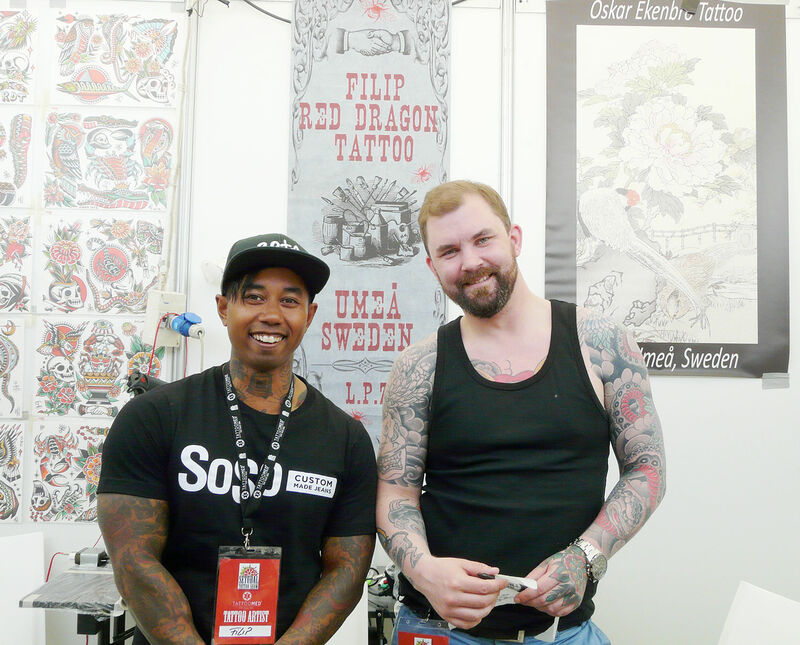 I met Henningsson at the Setubal Tattoo Show, it was windy as heck that day and it affected the audio recording, but I got a chance to talk to him about his old-school art style; what it was like for him meeting the famous tattooer/toothpick-man Oliver Peck, and if bodybuilding and fitness was his other big passion. 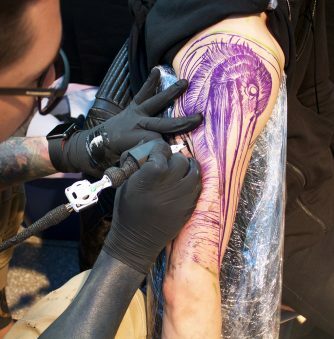 Above: Filip Henningsson focused on tattooing the leg of his friend (also tattooer) Oskar Ekenbro. 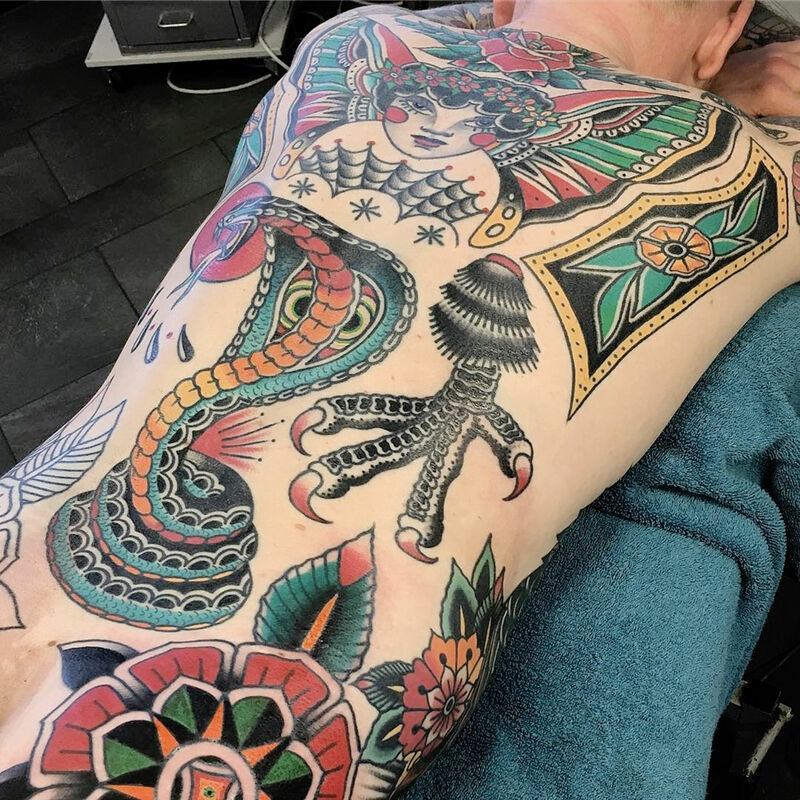 Large back pieces can take years to complete. 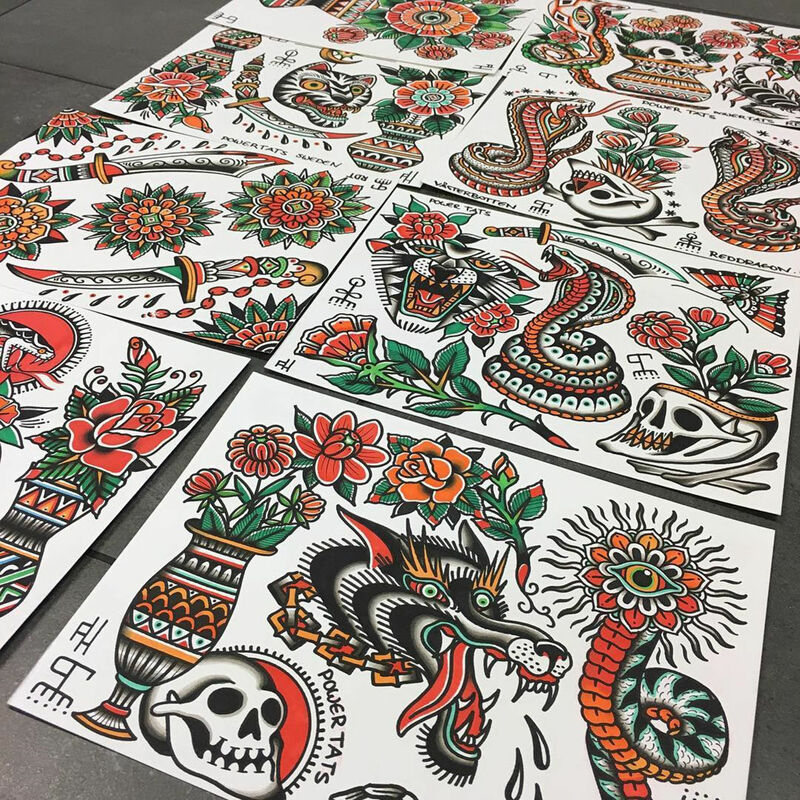 How did you meet Mats (the owner of Red Dragon Tattoo studio), and what is it like working with him for already 15 years? I met him the first time at his shop. 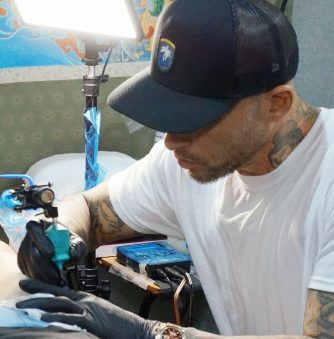 I went there when I was 18 years old and I wanted to get tattooed … and after that I was pretty much stoked about tattoos. 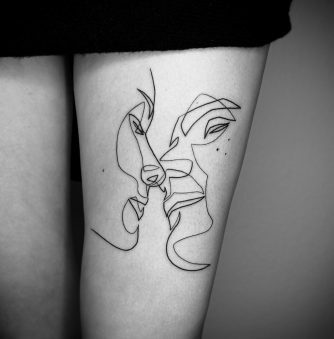 I always have been painting and doing creative stuff, so something just connected when I saw that I was drawing similar stuff in relation to people who create tattoos. Have you only worked with Mats? I’ve been working in different shops. 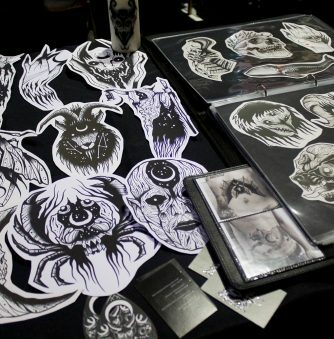 But Mats was the guy that taught me how to tattoo. Through him, I met a bunch of people. And I’ve been traveling a lot, in a lot of different studios and shows. I started traveling when I was just an apprentice. One of my first studios that I visited is Infamous Studio with Theo Jak; my friend Jenny was working there, and after that, I’ve been just traveling around. 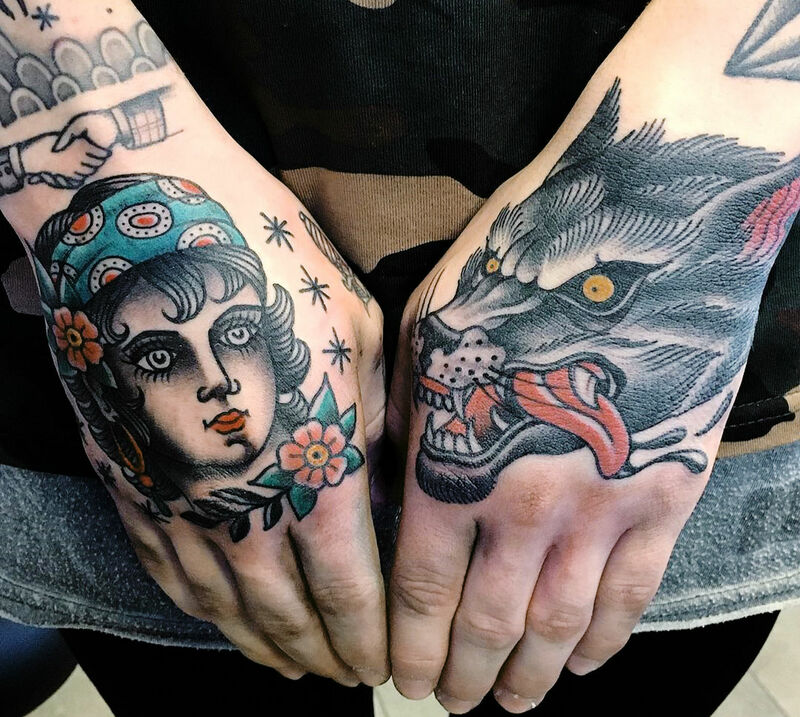 You are dedicated to keeping the old-school tattooing alive. What led you to working in the traditional style? I don’t know. I like when it is pretty simple. I like when it hopefully stays the way it was from the beginning. I like when it is just lines, shades and color. But I don’t think I had that idea in the beginning; I was doing everything then. But we are a street shop so we have to deal with everything. Even though I love doing this stuff, I also do other stuff. Because we are a street shop, I have to know how to handle a portrait if the customer wants it. 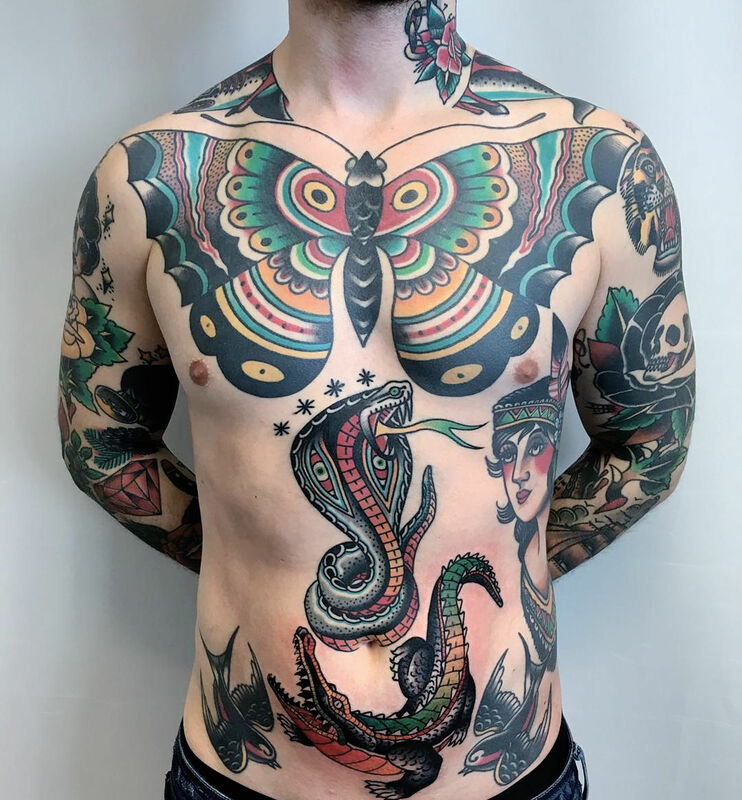 Some flash art, and below body art on Emil Hammarberg. 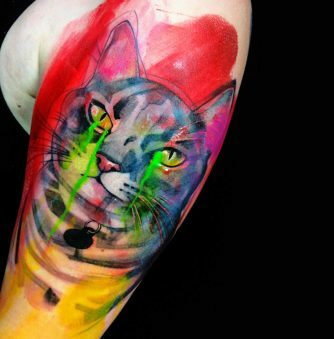 How many hours, months or years may it take to produce a large tattoo like the one on Emil Hammarberg? I think he started coming to the shop when he was 18 or 19. I don’t know … years! He is a dedicated customer. We are still doing a lot of stuff on him. What part of his body still needs to be tattooed? He is starting to cover his legs. The front is pretty much done. Did you ink most of it? Most of the stuff is from me. Yeah. 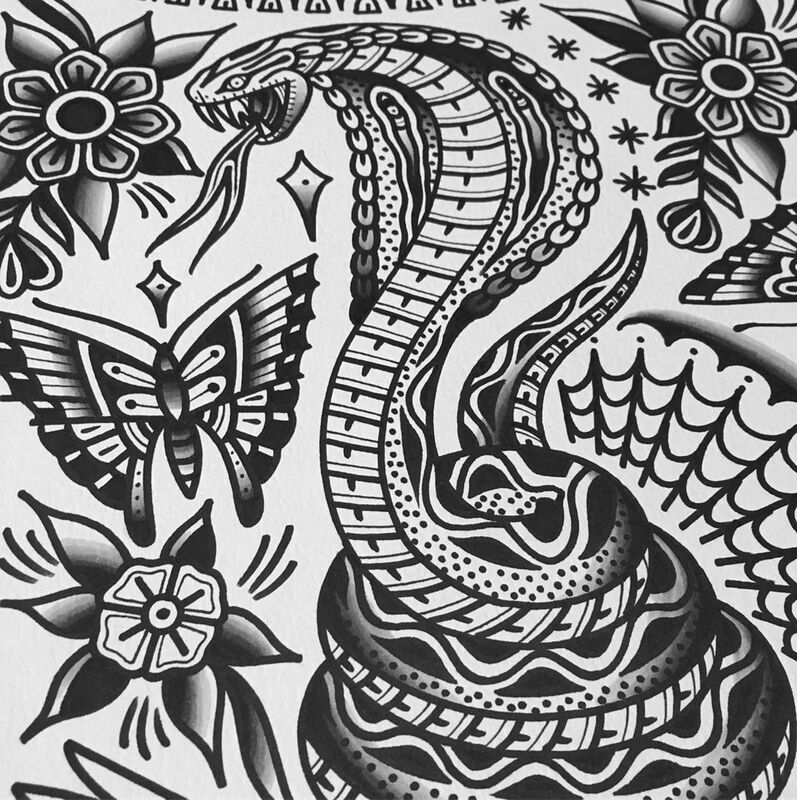 Tattoos on difficult parts of the body—neck, head, and hands. 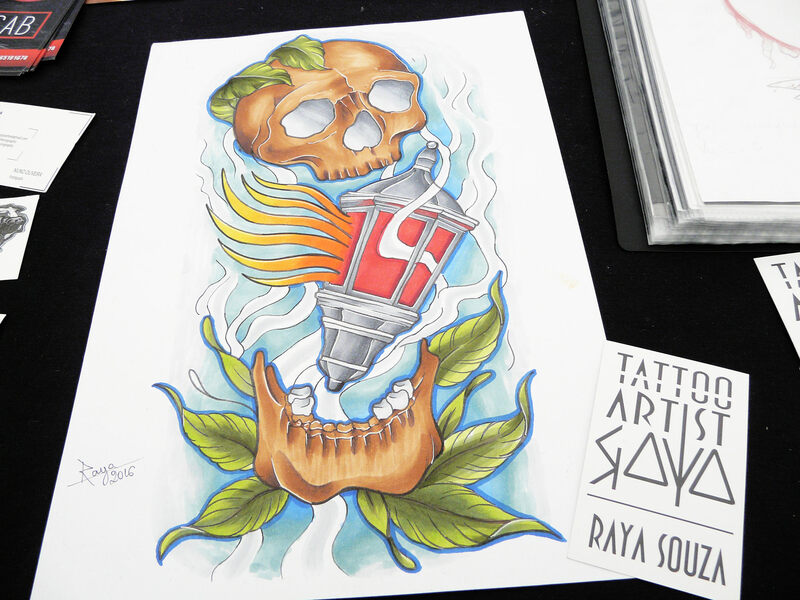 What is the most challenging body part to tattoo? Almost everything. It is super hard to make a design to work in different areas. But technically, maybe, the neck, since it is so hard to handle. For me, everything is a challenge. You met Oliver Peck; how crazy or fun was it meeting him? I met Oliver the first time in Sweden, a couple of years ago. I am a huge fan of his. 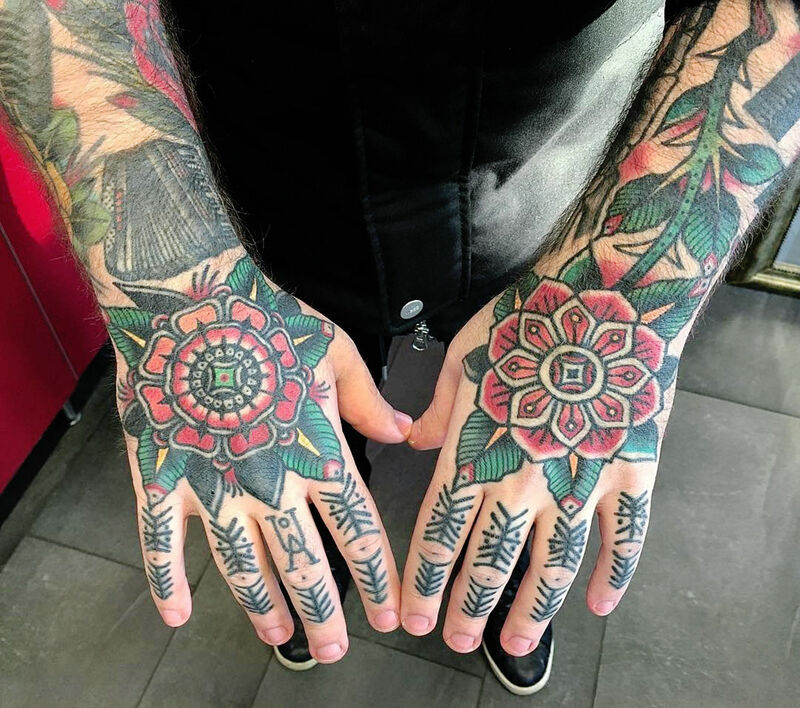 I went to Infamous studio because he was working there; got two tattoos from him. Then, I think went to a convention together with some common friends. After that, I slightly knew him. Last year, I went to the states and showed up at his place. Yes, it was in Dallas. He is famous for the toothpick. Yes, he always has that. Either on paper or skin, Henningsson is great at old-school designs. 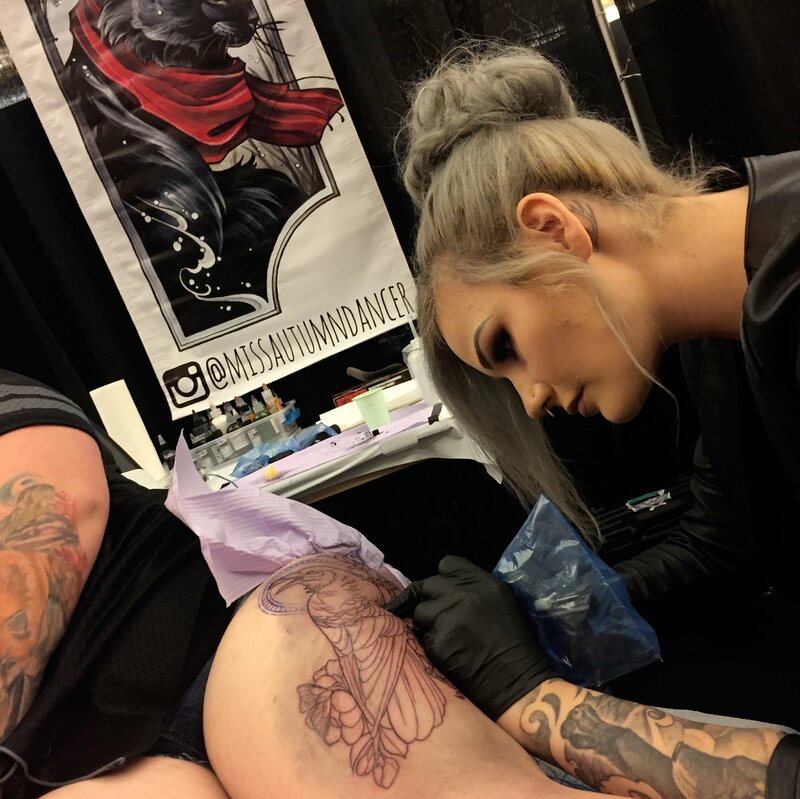 Aside from tattooing is Bodybuilding and Fitness your other passion? Yeah, I think so. I love working out. I’ve been doing sports since I was small … soccer, whatever. It is easier to go work out at the gym, especially when you have kids, and you can make your own time. No, I came third in the Swedish Championship for “Chin Ups.” Yeah I did three shows last year, but just for fun. 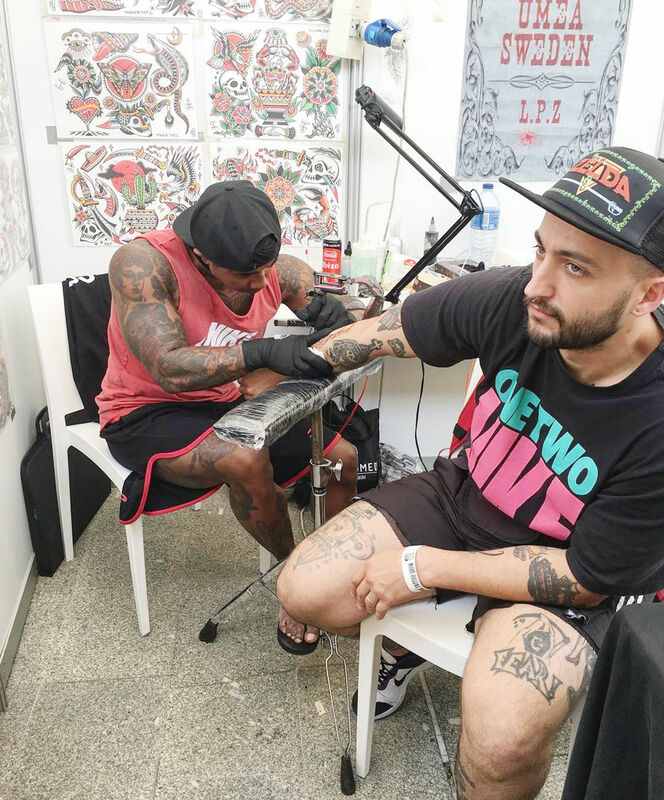 Filip Henningsson inking a client at the Setubal Tattoo Show, and below him and his Swedish colleague Oskar Ekenbro. 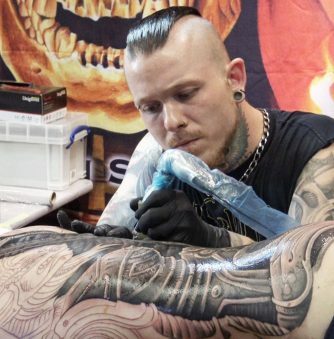 If you stopped tattooing would you dedicate your life to fitness and bodybuilding? Maybe. (Laugh). You never know. I think it is good to have two different things going on, with the exception of the family. In this kind of work [it is important] to get some exercise. Because we’re sitting for hours, pretty much in a bad way, and [one’s] neck and back can get fucked up. I think it is good to work out. You end up stiff from 8 to 10 hours at a convention. Yes of course. Definitely if you are in a show, and don’t have your own chair and stuff like that, it can be tough.